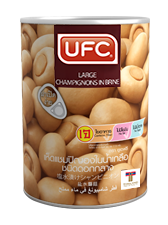 UFC Champignons in Brine is produced from fresh and santitised champignons which are then placed in brine. Champignons come in three sizes, large, medium and small; all filled with nutrients and fiber and suitable for stir-fried, boiled, baked, or fresh in salads. This product does not contain any preservatives and is cleanly sealed in certified packaging. It is ideal for both vegetarians and vegans.